I think that anyone who tries to produce something that might, on a good day, resemble art gets stuck, or as writers might label it, get writer’s block. I just might be getting photographer’s block! Over the past six weeks, I have devoted most of my photographic energies to portraits and environmental portraits for hire. Although some of the engagements have had an element of “creativity” to them, most of have not been pushing the envelop. I wonder what someone like Joe McNally does to keep his creative juices flowing. At the McNally seminar that I attended a couple weeks ago, Joe indicated that he tried to “keep pushing at edge of his abilities.” That sounds great, but how do you do that when a client wants you to produce an acceptable product. I do not have an answer to that one. I do know that when I get in one of these “funks” I will head over to someplace like Jamail Skate Park. Why? 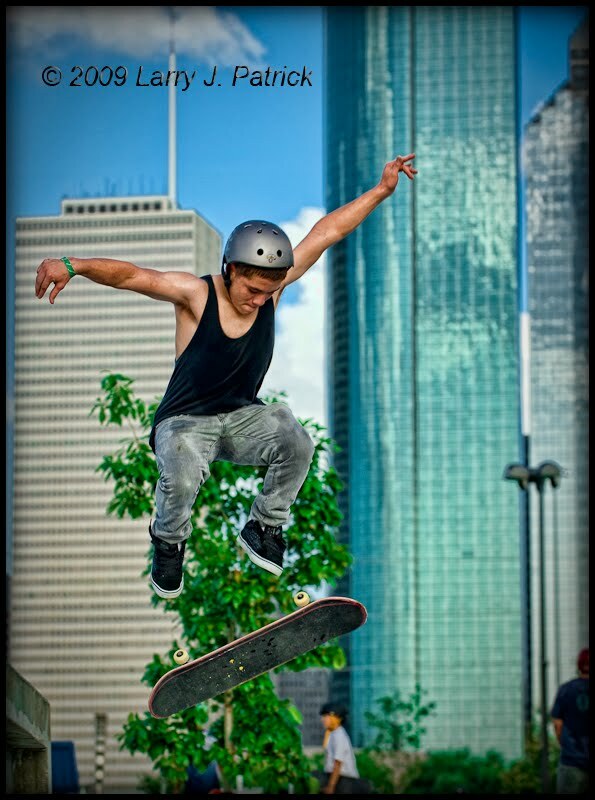 Because I do not consider myself a very good photographer of “action” and Jamail Skate Park is all about action. I recently went by the park and decided to experiment with high-speed synch flash. After watching this young man for about 15 minutes, I introduced myself and told him what I wanted to do. He was game. I got one of his friends to be my VAL. I positioned my VAL to camera right and determined that I wanted to use a shutter speed of 1/1,000 of a second and a f-stop of 5.6. I felt that these setting would give me adequate depth of field and also stop the action. I placed my VAL about six feet from where the subject would be and set my Nikon SU-800 to fire my Nikon SB-800 at 1/4th power. Photoshop—used Topaz Adjust Pop present to bring out details within the image. Nice action shot Patrick! I like the colors and composition! I like the inclusion of the kid in the background because it really accentuates the height of the subject has achieved. You controlled the light, exposure and depth of field to obtain a well done sport shot. I'm sure this kid and his friend were impressed with what you got with such minimal equipment. I can safely say I continue to be amazed in how you develop a vision of what you want before you shoot. I don't think it will completely break you out of your funk, but it's a start. Maybe when you go to Dickens on the Strand you will recapture that enthusiasm you feel you are missing. If this is being in a photographic funk, then where do I go to get my photographic funk? Good action shot. Dynamic photo. Great colors and great pose by the skateboarder. Hope he did not hurt himself.